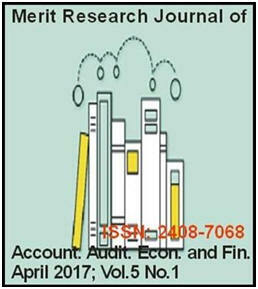 Merit Research Journal of Accounting, Auditing, Economic and Finance (MRJAAEF) (ISSN: 2408-7068) is a multidisciplinary peer-reviewed journal with reputable academics and experts as members of its Editorial Board. Merit Research Journal of Accounting, Auditing, Economic and Finance (MRJAAEF) is designed for the prompt publication of peer-reviewed articles in all areas of the subject. The journal articles will be accessed freely online. April 2017; Vol 5. No.1.